For those ladies who like a loooooong look with a gorgeous moccasin style, the Minnetonka Front Lace is a great choice. Note: This boot might not be the best choice for ladies who are quite petite or for ladies with wider calves. Style: Soft suede leather upper, cushioned insole, classic style moccasin boot. Dimensions: 16 inch shaft height, 13 inch circumference. Thanks for visiting the "Where to Buy Boots Online" blog! Purpose of this site: To provide shoppers with the "skinny" on the very best places to purchase specific brands and styles of boots for women, men and kids too. 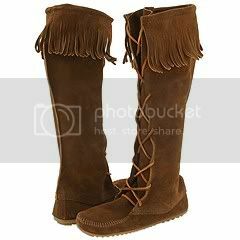 What you will find: Very specific brands and styles of boots. Information on each brand and style is provided, along with a good look at the top merchants who sell that boot - in what color or shade - and for what price. Our Merchants: All of the merchants chosen on this website are hand-picked for offering competitive pricing, most offering fast and free shipping. They are also well known for their exceptional customer service - often offering free return and exchange service on boots purchased when needed. How to Navigate: There are a couple of different ways to find the boots you are looking for. 2. Another way to find what you are looking for is to use the menu lists on the right. You will be able to take a look at what is offered on this site based on brand and specific or general style.